Did you know April is Month of the Military Child? 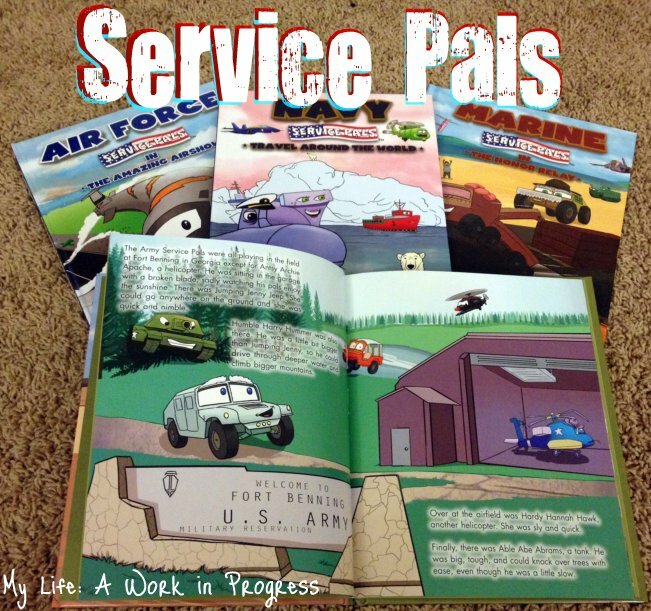 To review, I received a set of four books about Service Pals- the “Sidekicks of America’s Heroes.” Air Force Reserve pilot Maj. Johnathan Edmonds developed the concept of Service Pals when he couldn’t find any books to explain to his daughter in a happy light what he does in the military. The majority of books written for military kids are deployment-related (this is true-I’ve looked myself). When Edmonds couldn’t find what he was looking for, he created it himself. The characters of each book -military vehicles- have adventures and journeys, but deployment and combat is not mentioned. 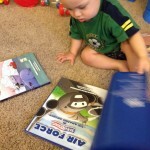 Baby J loves these books. They’re very colorful, and I think that appeals to him the most. He keeps “stealing” them and dragging them into the kitchen (I don’t know why that particular room). I love these books as well. I’ll go into that in a minute. I do have one cautionary note. These books don’t seem to be built for babies or very young children. What I mean is, they’re not made with fabric or a cardboard type of paper, etc. They will tear, and these books are so lovely, that’s the last thing I want to happen. I read these books to Baby J, but then I make sure to keep them high on one of our book shelves, out of his reach, the rest of the time. When he’s older and more responsible, he can have them back. I want them to last. Edmonds plans to write more books, including one for the Coast Guard. I think that’s a great idea, and I really hope he does. I’d buy subsequent books for our kids, especially if they were about the Navy. As I mentioned in the beginning of this review, I’ve looked for military books for kids and the vast majority are deployment related. There’s a definite reason for that, and I’m happy that type of book exists. When J leaves next year, and again, and again, deployment-related books may help Baby J and me cope. But for all the rest of the time, books like Service Pals fill the void. I have yet to see anything quite like them out there. 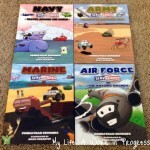 Finally, although I think these books are perfect for military children, civilians would find them very educational too. Each book retails for $14.95 or buy the entire set for $50. To purchase and learn more, visit MyServicePals.com. You can also check them out on Facebook and Twitter. Readers of My Life: A Work in Progress can save 20% on their purchases through May 15! Just use the code MYLIFE when checking out. Note: I received complimentary products to facilitate this review. The opinions expressed above are my own and may differ from the opinions of others. My Green Confession: Paper or Plastic? My oldest is in the military and he and his wife are expecting their first child very soon. It’s great to know these books are out there, I’ve bookmarked this page and bet I’ll get one at one point or another. Thank you for sharing! I love this! My husband is army so I think my little guy would really enjoy learning about daddy’s job! Hi, thanks for commenting! That’s great to know- I can definitely see the appeal to civilian kids too. They have great, positive stories and cute characters. Great pictures, by the way! 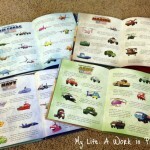 Love these – what a great gift for a child that has family members serving! I love it when we find something that fills that niche were looking for! My husband was in the Navy. These are cute books! These look great! 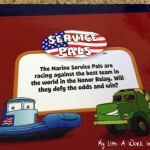 My BIL is in the military – I bet my nephews would love these! I love the illustrations in these books. Thanks for sharing. 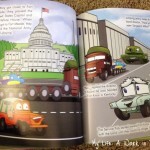 What a great way to teach our children about the military. My nephew was in the Army – I would love to get these for his kids – they are just learning to read now so these would be great! Great books, great concept thanks for sharing! Those are really cute books. What a great idea. What a wonderful idea! Thanks so much for helping to spread the word. It’s so important that children learn about the military.